Gardaí believe they know who was behind the murder of Michael Keogh. GARDAÍ BELIEVE THAT there are at least 24 members of the extended Hutch family who are at a serious risk of retaliation from the Kinahan cartel following the murder of Michael Keogh on Wednesday morning. That number includes women who are believed to have nothing to do with the feud itself but happen to be related to targets of the Kinahan gang. Some innocent people, who have attempted to change their surname, have already fled the area. While there are 24 Hutches at risk, this does not take into account their partners or older children who could also find themselves in harm’s way. Gardaí fear the Kinahan’s retaliation will be as quick and severe as it was following the murder of David Byrne at the Regency Hotel in February 2016. The exodus of potential targets from the north inner city is also becoming a headache for officers who are trying to keep track of their movements. There are two women gardaí are particularly concerned for as they live in an area which with ‘a large Kinahan element’. These women have nothing to do with crime other than being directly related to some of the more high-profile members of the Hutch gang. Gardaí have been making significant inroads in the investigation into Keogh’s death on Wednesday. They believe a convicted criminal from the north inner city was responsible for his murder. He has convictions for armed robbery and a number of non-violent offences. They entered his home yesterday after securing a warrant to search the premises. 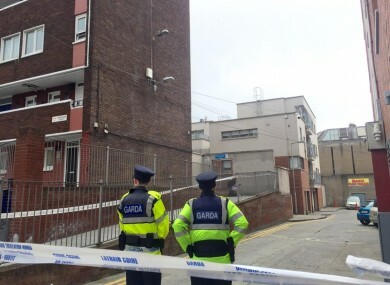 Gardaí took clothes and other items which will now be tested. It is hoped that DNA from the clothes can be matched to the DNA left in the car discovered partially burned out after the murder. Keogh was discovered with a number of gunshot wounds to his head as he sat in a Volkswagen Golf in a car park at Sheridan Court in Dublin. His associates were believed to be part of a new group styling itself on the Irish National Liberation Army (INLA). It is thought they had been taking some of the ‘protection business’ (bribing local businesses in exchange for protection) freed up by the demise of the Real IRA and Alan Ryan’s gang since his murder in 2013. Gardaí believe an associate of Keogh had also been acting as a hired gun for the Kinahan cartel. His brother, Johnny Keogh, has served time after he was discovered to be making pipe bombs for the INLA in Clondalkin. Although officers are not ruling out potential dissident republican in-fighting as a reason for the killing, they believe that the man’s link to the Kinahan cartel is what got him killed. Despite starting a new job the day before his murder, Keogh had been accused of being involved in targeting the homes of a number of innocent members of the Hutch family in recent days. This intimidation is believed to be the catalyst for his murder. His level of involvement has not been specified. Email “There are at least 24 Hutch family members who are potential targets of an attack ”. Feedback on “There are at least 24 Hutch family members who are potential targets of an attack ”.